Here is the poster for this weekend’s Constitutional art party in St. Johns, 9am-2pm. 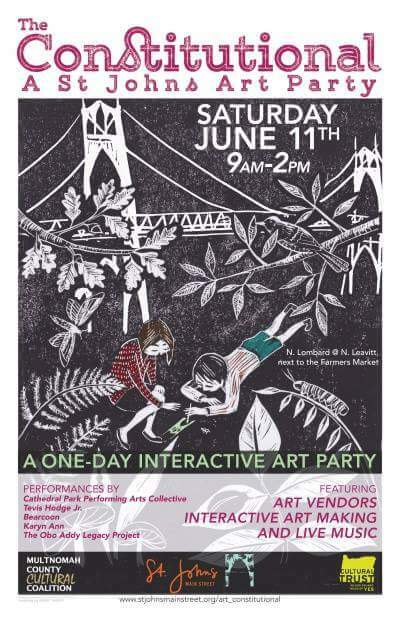 Vendors in Cathedral Park plus a number of other fun activities. Make sure to drop by Proper Eats Market & Café if you visit, and see my show currently up in the dining and front window areas! This entry was posted on June 7, 2016 by laughingnewborn. It was filed under Uncategorized and was tagged with art festival, St. Johns Portland Oregon, The Constitutional. I would give most anything to see this.